I wanted to make a home weather station by decoding the weather information embedded in the DCF77 time signal. This pages describes how you can do that using a special chip and an arduino. If you are looking for a ready built weather station you can find an excellent and cheap one here. 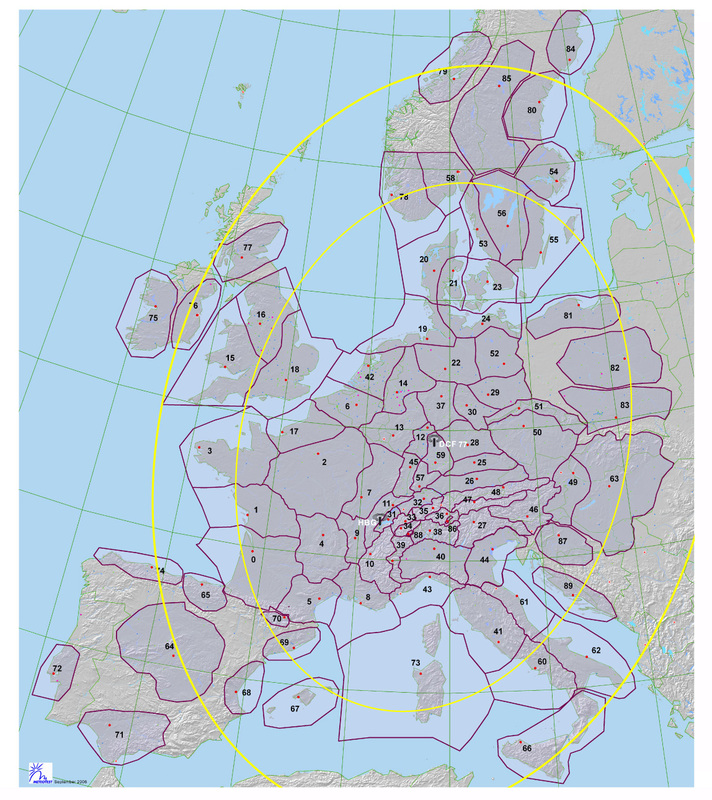 Meteotime is transmitted, alongside the time and date information, from the DCF77 transmitter situated at Mainflingen in Germany. In each minute there are 14 bits which are sent and one weather message consists of three consecutive minutes of 14 bits of weather data. So in all 42 bits are used. In Meteotime systems built in to weather stations these 42 bits are all sent to the decoder chip. 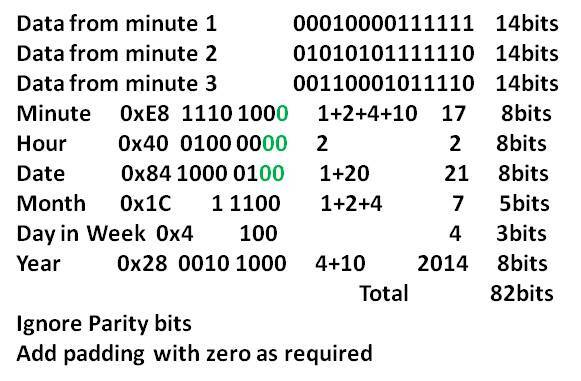 In addition there are 40 bits needed derived from the time signal itself. This acts as the cypher. Below you can see a typical exchange between the decoder chip and the arduino. The 82 bits data is clocked in and the result can be clocked out on the Dataout pin. 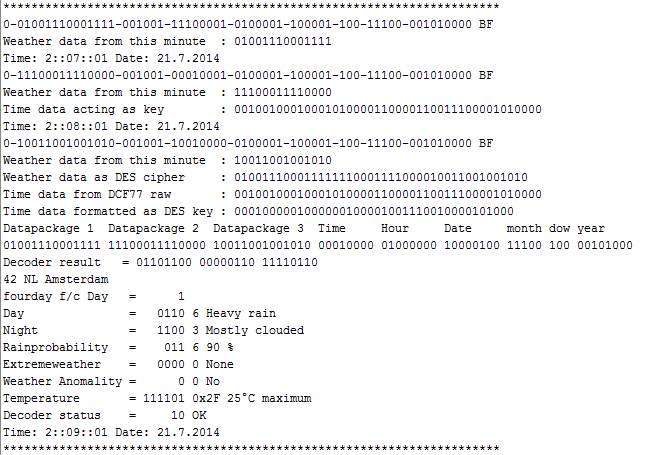 The transformation to the weather information data in the decoder result is done with a modified version of DES. This makes decoding difficult but it can be done. On this page you will find the first method to make a home weather station which involves using a special chip which does the decoding for you. This decoder result is a message which contains the weather information. So lets see how this decoding is done. 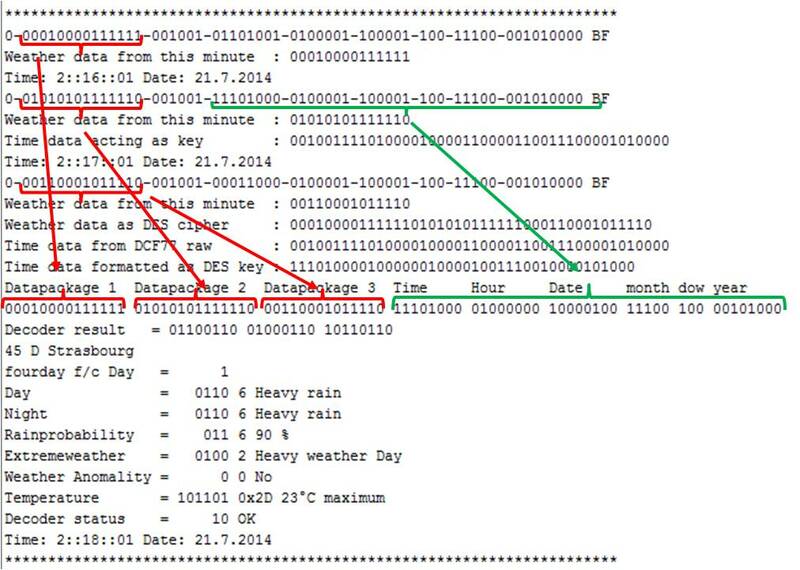 The first and easiest way to decode meteotime is to use a decoder chip. This has been developed for Meteotime by HKW and is used in many of the commercial weather stations you can find. 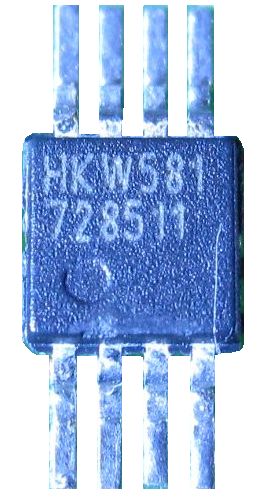 The chip is called the HKW581 or sometimes DC-IC or Deciphre-IC. You can find a description here. Meteotime are providing the weather forecast and their earning model is based on receiving a license fee for every chip that is sold. As i do not want to undermine their business I have secured a source for the HKW581 chip which includes the royalty for the lifetime of the home weather station you build. You can buy this chip separately or as part of an arduino shield from my webshop. This chip has pins for: DataIn, DataOut, ClockIn, QOut and BFR (Which stands for Brute Force Reject status. It is a simple handshake with which the arduino talks to the chip. After powerup you must first wait for the warm up period. This can be as long as 40 seconds although i seldomly experienced more than 30. Then you have to ClockIn the data. You set the first bit on DataIn, and then pulse the ClockIn line. This you do 82 times for all 82 bits. Once all the data is clocked in the decoding chip calculates the result. If this is done, the QOut pin goes high. From now on the ClockIn is used to clock out the resultant bits (and the data appears on DataOut). If Qout has gone high, the first bit appears on the DataOut pin. Now you give the next ClockIn pulse, then the next bit is on DataOut. This you do 24 times to collect all the bits. Starting condition all lines low. 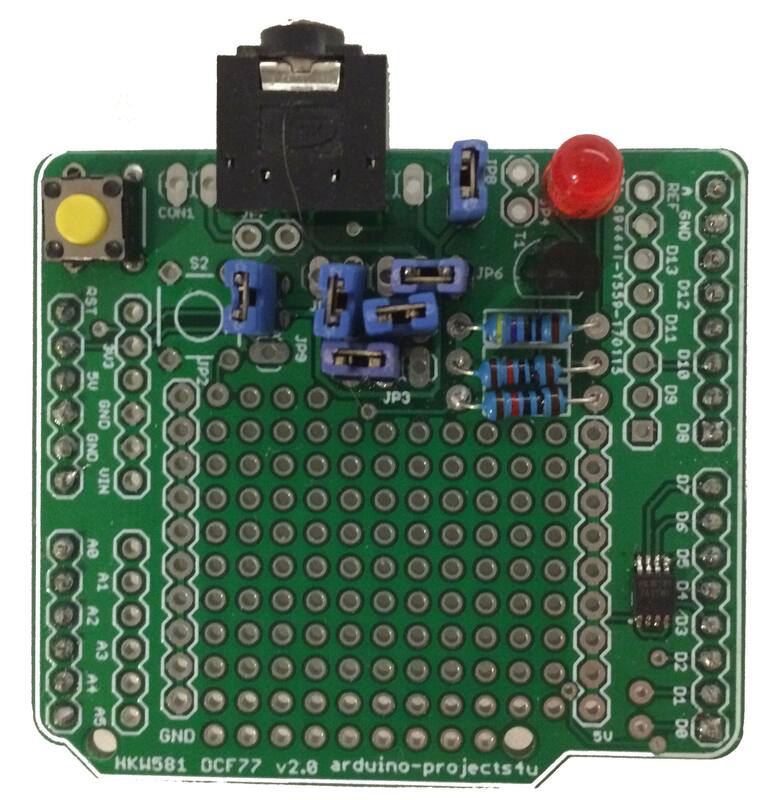 Below you can find the arduino program that communicates with the HKW581. It is just a demonstration program which sends a 82 bit string to the chip and reads back the result. It then compares the result to the desired result to check if it is correct. It is claimed that the HKW581 has the ability to correct the telegram even if one bit is incorrect. Experiments show that this is not the case. In this demo program the technique for correcting one bit errors is demonstrated. One bit in the 82 bit string is changed and the HKW581 chip calculates the output. 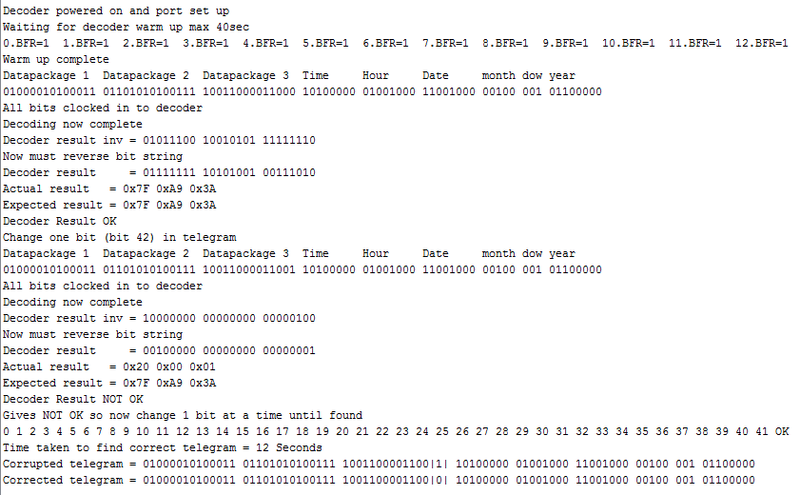 The output telegram should end in ’10’ if it is correct. So by flipping one bit at a time and looking for this signature in the last two bits in the output telegram one can discover if one bit was wrong. // It is claimed that this happens in de decoder chip but experiments show that this is not the case. 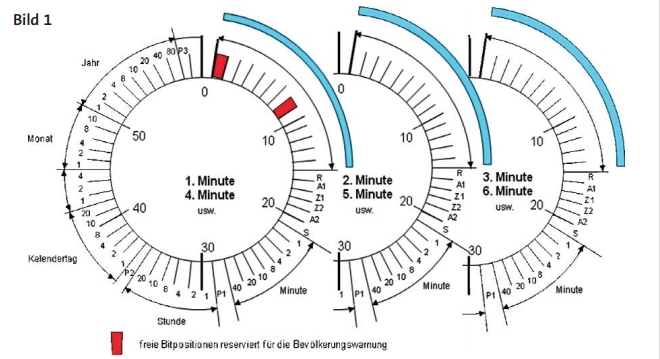 // The parity bits and comparing the time to previous minute can correct the time key part of the DES. // Practically this will be used to correct errors in the weather data. This takes 12 seconds to complete. // This is easily in the three minute window before the next decode is required so that this is a practical proposition. // This example code is in the public domain. // You may use this software as you see fit as long as this header portion is included. // Since this program may involve some hardware please note I'm not responsible if you destroy anything while tinkering with this software. // Here routine for single bit correction. Look for correct output inverting each bit. Below you can see an example of the output from this program. You can see how the HKW581 finds the error bit in the input string. If you send an incorrect telegram you allways get the same answer. 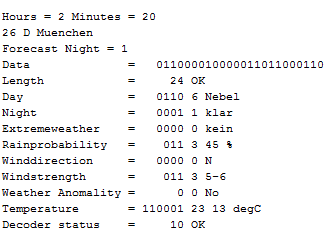 Meteotime uses 22 bits of data with 2 bits additionally indicating the status of the decoder. These status bits are ’10’ if all is OK and ’01’ in case of a failure. And here is the corresponding output. This gives an output of “011001000000011011000110” including the last two status bits. So this is all there is to it. Now all you have to do is connect up the HKW581 and program the arduino and away you go. I used a prototyping board and simply wired all connections using small pieces of wire. The audio connector is actually the antenna connector from HKW Electronik. This is quite convenient as you no longer have to worry about loose connections as the EM2S DCFn module and ferrite antenna are mounted inside a plastic box. Perfect solution and very stable. I chose the version in the link above which was 39.50€ and worked perfectly and more stable than the conrad module. The final step is to translate this decoded weather data into a human understandable form. What the different bits mean is according to a table http://www.arduino-projects4u.com/pdf/DB%20W-Protokoll-V%201.pdf. This also explains the meaning of the decoded Meteo data. Unfortunately there are some errors in the document. Thomas berends has found solutions to this which he uses on his website. I have made an effort to incorporate these improvements into the software. The following program does the job of translating the raw HKW581 output data into a human readible format. I have by no means done exhaustive testing so it may still contain some errors. (If anyone finds any mistakes please let me know). It uses the flash library from arduiniana which you need to install from here. Below you can find a screendump from this program. You can see the time the data was collected from was 2hrs 20mins. This means it is from Region 0-59 and contains night data. The city number can be calculated by looking at the lookup chart. In this case number 26. This makes the city Muenchen in Germany. Then follows the decoding of the weather information. //  You can play around with them to get different effects. //  version 2.1 of the License, or (at your option) any later version. //  Lesser General Public License for more details. if (DCF.DCFhour<21) //Between 21:00-23:59 significant weather & temperature is for cities 60-89 wind and wind direction for cities 0-59. Here finally is the final program. Decoding the DCF77 data and presenting it to the HKW581 chip, receiving a reply and translating this into human readible code. It uses a lot of RAM which means it does not work on an arduino UNO. However both 1280 and 2560 MEGA processors are OK. Here is an example of the output of this program. You can see how the data is collected from the DCF77 output and assembled into the DES cypher and DES key. It is then clocked into the HKW581 and the result is translated into human readible form. Below you can see a map showing the region numbers throughout Europe. I have made a HKW581 DCF77 receiver shield for arduino. The design can use most DCF77 receivers from many brands but i recommend the Aktiveantenna-S-DCFn receiver module from HKW having the receiver board and antenna mounted inside a plastic case with plug. The audio connector socket into which this plugs will fit onto the connector pins on the HKW581 DCF77 arduino shield. All the pins are prewired so there is no connecting to do. The boards are now available in the shop. 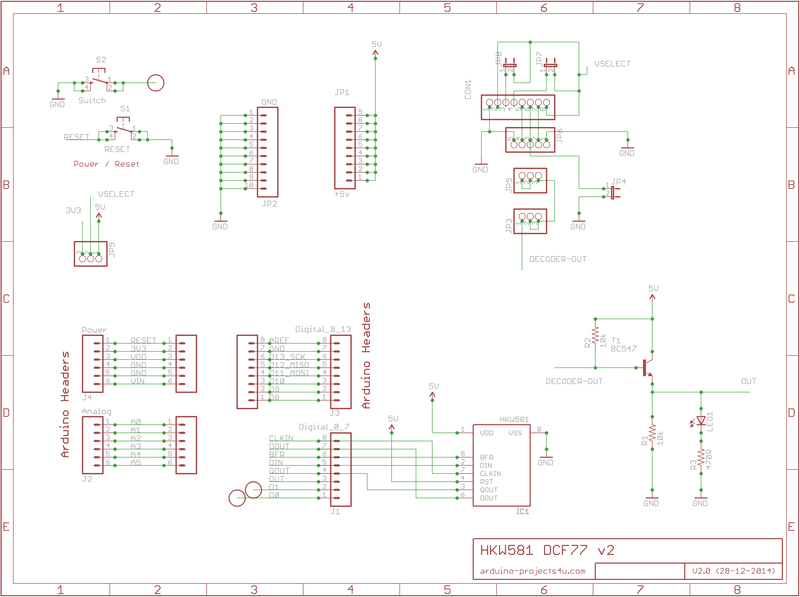 Please click on schematic or PCB image to get a larger view. Below you can see the jumper connections depending on which board you are wiring to. 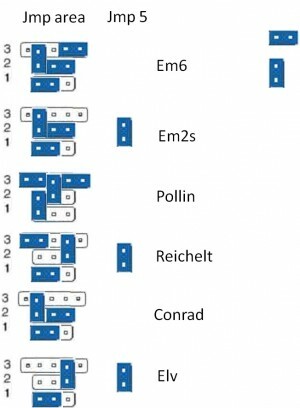 You can find out a bit more about the Meteotime signal and decoding it using only an arduino here. 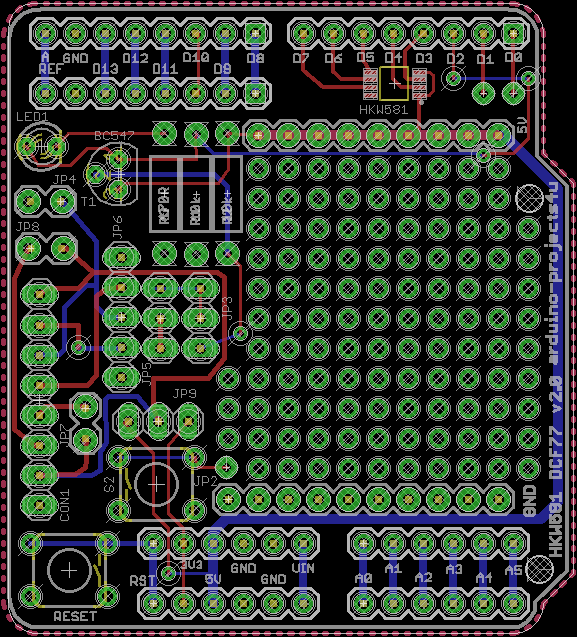 If you are still wanting to build a DCF77 receiver look here.